In the second of our 5 part 'Meet the Choir' series, we introduce you to choir members Sarah Godwin, Michael Dixon, Denise Horvath-Allan, Melanie Steele, Siobhan Dunne and Alan Jones. 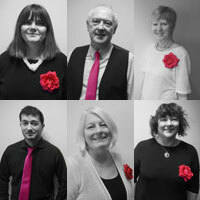 Read on to find out why they joined the Choir and what their favourite memories are so far. Sarah: I wanted to experience the feeling of singing in a group who totally understood the depth of feeling in the music. Melanie: I was volunteering in the Fundraising Team at Missing People when I heard that a choir was being formed. It seemed to be a great way to extend my involvement with the charity, plus I’d been wanting to join a choir for a while. I never imagined that what started off as performing at the annual Missing People Carol Service would lead to auditioning for Britain's Got Talent! Alan: I was asked to join the Choir by Jim Hawkins, the Choir Director. 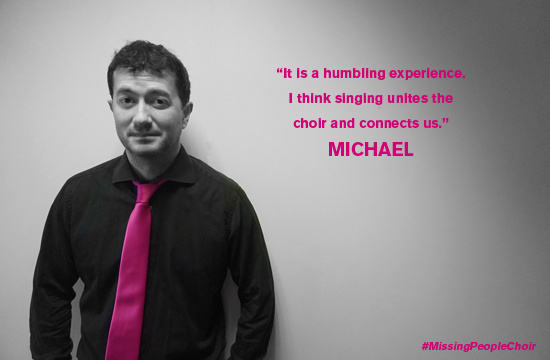 Michael: In Autumn 2015 I became aware of the 'Missing People Choir' rehearsals due to the choir and charity's connection to my organisation, the National Crime Agency, and had received an email seeking a couple of new male voices for the choir. 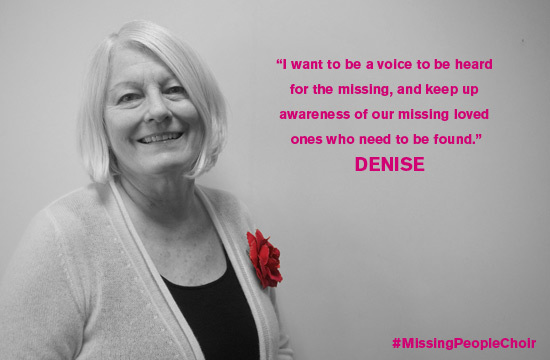 Denise: I wanted to make a difference, be a voice to be heard for the missing and keep up awareness of our missing loved ones who need to be found. Sarah: It’s just so energising, warming, safe, moving beyond words. We can each feel our own love and sadness and pain, but we are there for each other and somehow it becomes joyful too. 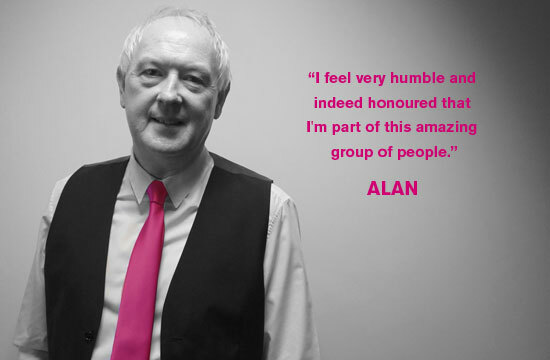 Alan: I feel very humble and indeed honoured that I'm part of this amazing group of people. 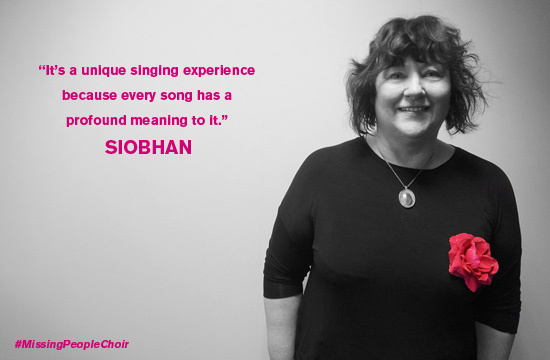 Siobhan: It is a unique singing experience because every song has such a profound meaning to it. Sometimes it is a little overwhelming. Melanie: It has become really important to me. I love the singing but it has also been great getting to know everyone in the choir and coming together to do something really special. Also, I have met up with one of my old school friends who is also in the choir and I hadn't seen for 30 years! Michael: I feel it is a humbling experience to be around the family members and I hope I can offer them some support/friendship too. 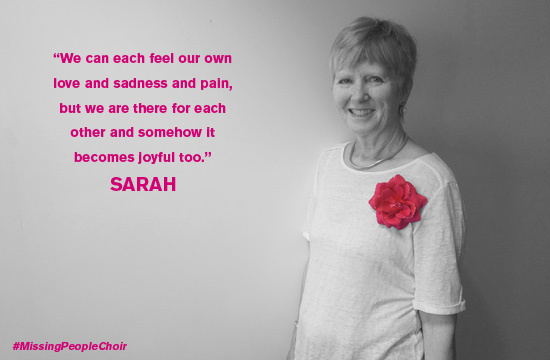 I think singing unites the choir and connects us, it also I think has been uplifting for me as someone who has had some personal struggles in the past. Alan: It has to be ‘I Miss You’. The words now mean so much more to me. Sarah: For me it's ‘I Hope’. The lyrics are so accurate in saying what it feels like to go through the constant realms of hoping for something, how that changes but is always there. Hope is such a powerful driver and a tough, difficult emotion in the world of missing. Denise: Mine is also 'I Hope' - the lyrics are so meaningful, they say so much and because ’without hope we all have nothing'. Melanie: For me too, it is 'I Miss You' as it was the first song we sang together. Also, the fact that Peter wrote the lyrics makes it a special, highly emotional song to sing. Michael: I would say my favourite song is 'I Hope'. The combination of the arrangement of soloists with the choir makes this especially powerful, effective and emotional. Saying this though, I love all of our songs! Melanie: Recording 'I Miss You' at Abbey Road Studios was pretty special. 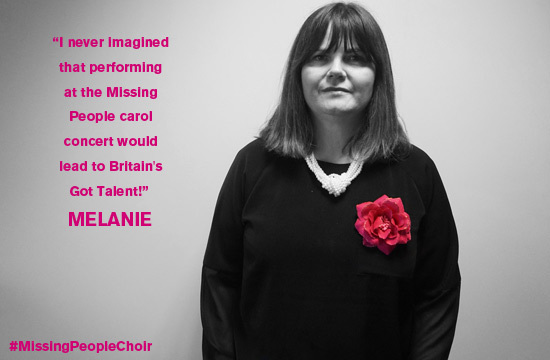 Denise: Performing at the Missing People Carol Service held at St Martins-in-the-Fields; being able to sing from my soul for my lost boy, a precious memory. Sarah: Our audition for Britain’s Got Talent on stage at the London Palladium. I felt that the choir really came together that day, and it was just beautiful. It was a shared moment and one that none of us will ever forget. Alan: Just the whole experience. I would never have guessed that 2 years ago I'd be where I am now. Thank you. Siobhan: Difficult one- probably the audience reaction at the audition. Sarah: The final moments when we finished singing and everyone, audience and judges, were applauding. I felt then that our message, our purpose in singing had been heard and felt by many others. Denise: It was the effect singing 'I Miss You' had upon the Judges and the audience, realising that the words and music had reached the hearts of all those at the London Palladium; their reactions, the tears, standing ovation and the euphoria felt when the Judges announced their decision. Melanie: Even though I was incredibly nervous and my legs shook throughout, I most enjoyed our actual performance on stage at the Palladium. It was hugely emotional but exciting and exhilarating at the same time.